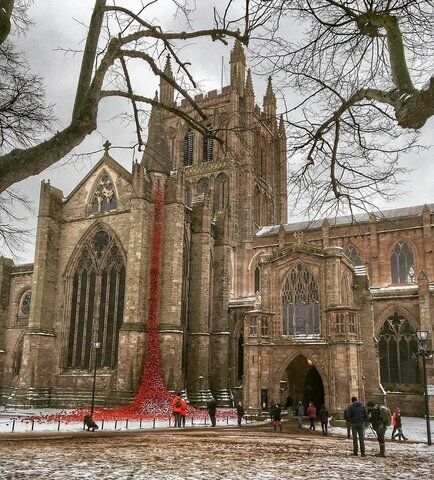 The Weeping Window at Hereford Cathedral is looking fantastic. 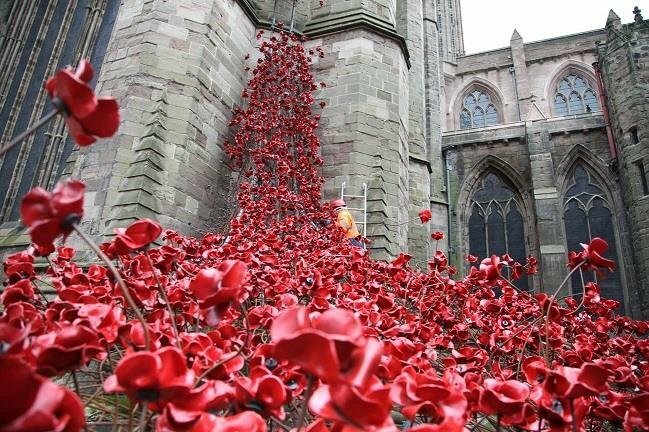 This magnificent waterfall of thousands of individual ceramic poppies will be on show from 14 March 2018 until 29 April 2018 as part of the final year of 14-18 NOW’s UK-wide tour of the iconic poppies. This is a must visit and we are looking forward to supporting this beautiful display in our stunning Cathedral. (Photo courtesy of Herefordshire Council). Looks great though surely would have made more sense and would get more attention if it had been put up in November. Edit: Nevermind, it's a touring exhibition. Did I read some where that some dog owner had allowed their dog to run loose and managed to break two of the poppies. Only in Hereford would this happen! Here is another photograph we took over the weekend and added to our Instagram account. The grass area in front is starting to look a mess.